Click the image to see the original theatrical trailer for the Kenya: The Documentary Film. 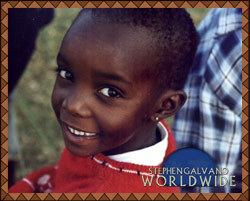 A documentary film crew traveled with the Stephen Galvano Worldwide team to document the SGWW Kenya experience. The crew was headed by Steven Galvano with additional photography and technical assistance by Jeremy Galvano and Jim Kasanga. Jeremy Galvano was also responsible for still photography. Many native Africans also assisted with the project. Frank Onjor and Martin Ondere were responsible for auxiliary audio mixing and feeds, and Lydia Muthami and Erick Nyamai assisted with video. Others assisted with rigging, equipment, and security. Kenya was shot entirely on High Definition video. Over 80 hours of HD footage was captured. Additionally, over 100 hours of digital audio was recorded including native song, sounds, and dialogue. The film, Kenya, premiered at the World Ministry Conference in New York. Many delegates and representatives from Kenya were in attendance. An exhibition called The Kenya Experience is displayed during the annual World Ministry Conference. The exhibition contains many Kenyan artifacts related to culture, tradition, and commerce. It also contains a photo gallery; native music (including original music from the film); native African art; and multiple video monitors with previews and special scenes from the film. Kenya, The Documentary Film is the combined effort of nearly 200 individuals including producers, composers, journalists, researchers, photographers, digital artists, animators, and audio technicians. For more information on the production of Kenya, see the article entitled The Making of Kenya. The article was also recently published in a leading national magazine for film and broadcast producers. Kenya is the 4th feature film produced by Colors Studios. Since its release, the film has been receiving rave reviews from viewers and film-industry insiders. 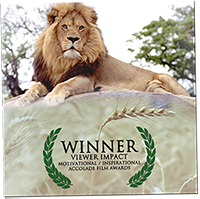 In addition to it being played on the film festival circuit around the world, RCCM estimates that Kenya has been viewed by over 1 million people on SGWW.org and other web outlets. The following poem is a compilation of previous writings by various people about their experiences in Kenya. The rhythmic chant of exotic birds outside my window each morning singing to the backdrop roar of the distant waking lions. The beating wings of moths and other large insects that curtain the sky on a rainy night. The rise of a politicians voice as he gets more and more indignant at accusations, more certain of his righteousness – valid or not. The children – so small and tattered, bare feet covered with callouses and the red dust of the city – “Jambo! Buy me something to eat!” they insist. …….”hapana” is how you say no in a quiet voice over the lump you have to swallow each time in your throat. But you say it each time. 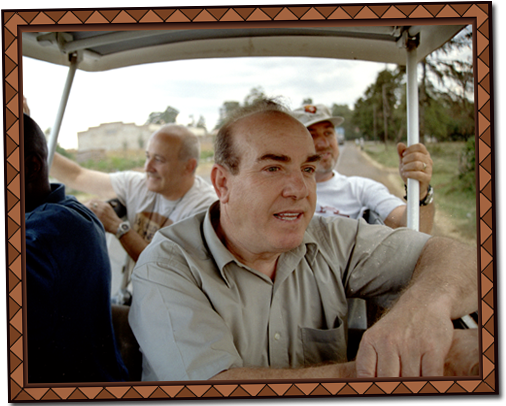 While in Kenya, the SGWW documentary team recorded many hours of breath-taking native song in various places including churches, homes, bus stops, and slums. The team also recorded the SGWW outdoor crusades with teachings by Stephen Galvano. Many of these items are included in the documentary film Kenya. Click the image to see the promotional trailer which was released before the SGWW trip. Click the image to see Kenya Trailer #2. The Kenya Experience is an exhibition which occupies over 1000 square feet of the RCCM headquarters in Rochester, New York. The Kenya Experience exhibits many native Kenyan artifacts, collected during the SGWW Kenya trip, related to culture, tradition, and commerce. The exhibition also contains an extensive photo gallery with over 100 original framed film prints shot by the SGWW team. Also displayed is native music; (including original music from “Kenya” the documentary film) native African artwork; and multiple video monitors displaying content and video clips also from the film. Be prepared! You may encounter the sights, sounds and fury of African wild life, or be enveloped in a torrential downpour as the sun sets in the Serengeti. You may even get to drink fresh milk from a coconut with Stephen Galvano! 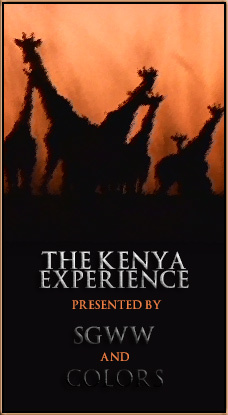 The Kenya Experience is open only during special events.